In the last year or so I've been getting back into board games. If the phrase 'board game' conjures up Monopoly or Risk in your mind, that the wrong image. I played board games a fair bit in my teens, but even then I had little time for such poor games. My taste then led to Diplomacy and Kingmaker - but then drifted off into simulation war-games and D&D. My recent re-ignition has been around German-style Board Games, ironically fed by my old D&D group in the UK. While we've been over here for a few weeks we've had the chance to do a good bit of board gaming - it's tougher in the US as we don't have a group of friends in the Boston area who are into board games. A community, focused in Germany, developed around designing board games in the 80's or so with a particular set of principles. The idea is to make board games that have interesting tactics and strategy, yet are easy to learn, play in a couple of hours, stay fresh with multiple plays, and keep everyone fully engaged till the finish. 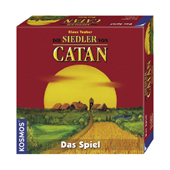 This style really flowered with a game called Settlers of Catan in 1995, and now there are quite a few excellent games in this category, many of which are recognized by the Spiel des Jahres award. For most readers of the this blog, the best game to try to see if you like this sort of thing is Settlers of Catan - the game that's paved the way for this genre around the world. You can learn how to play in ten minutes of play and be competitive in your first game. However there's lots of room for skill as you choose between multiple strategies which have to change as other people make their moves. The board represents an abstract island on which you build settlements and cities, for which you need resources that the island provides. The island is dealt out differently each time, which helps keep the game varied. You also get resources by trading with other players, which keeps the game very interactive. We've played it a couple of dozen of times, often night after night, and so far it hasn't got stale at all. I have the orginal German edition of The Settlers of Catan (Die Siedler von Catan) and its two expansion packs: Cities and Knights (St臈te & Ritter) and Seafarers (Seefahrer). These all have coloured wooden pieces, and the board is made of hexagonal cardboard that can build up a unique map as the settlers explore.